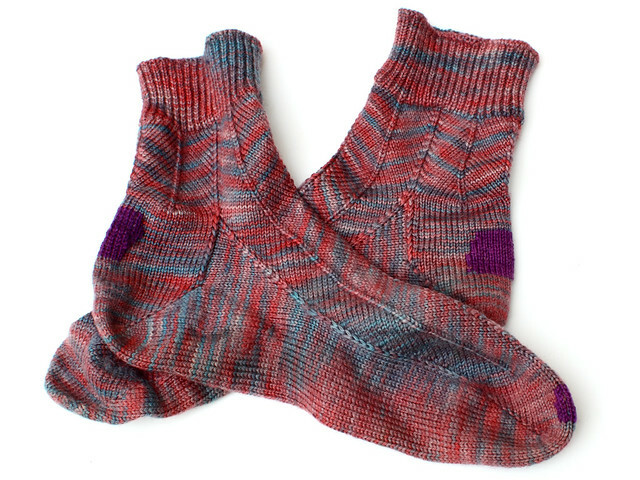 These KoolAid dyed Jaywalkers were my first proper pair of socks. Despite not being a fan of the pattern (they have no stretch and had to be re-knit several times to get them big enough to get on and off), I am fond of the socks. I’ve worn them a lot and they’ve lasted well given that I didn’t use a tightly spun yarn. I wasn’t surprised to notice that there was a hole in the toe and the heel stitches had worn down to a thread, and I didn’t begrudge mending them. Actually, it’s nice be fixing signs of wear rather than damage from nasty winged creatures. Luckily all of the stitches were still discernible, so I reinforced them by following the path of each stitch with a yarn needle and sock yarn. 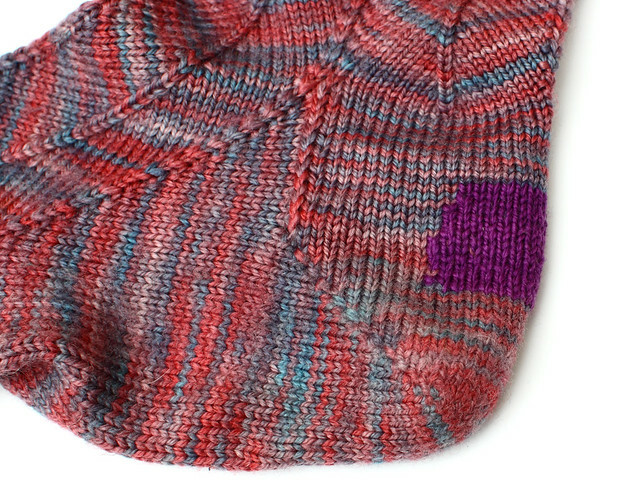 I later discovered after seeing this post on creative mending that this method is called “Swiss darning”. Yes, I’m aware that my mending is not exactly invisible. I opted for the most hard-wearing yarn I could find, rather than the most similar. This method does take a long time but it is very easy and could be invisible (with the right yarn). I’m hopeful that I wont be mending these again for a couple of years at least.